A text with this backstage moment showed up at DI HQ this week with the note, “Thining of you.” While some might be offended by this sentiment, we at the Impound felt the love we knew was behind this shot. 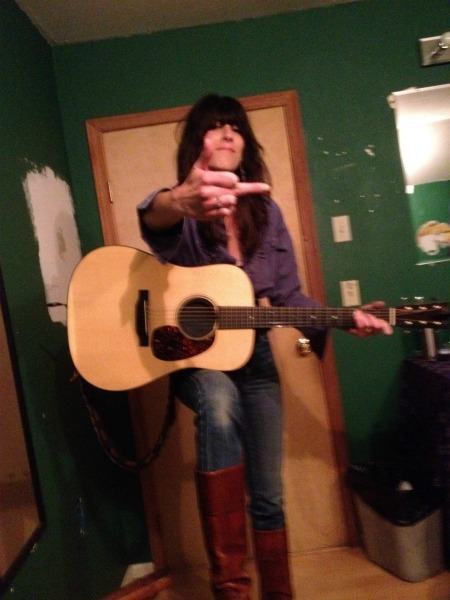 See, Nicki Bluhm and her mighty Gramblers know that a lil’ attitude goes a long way in rock ‘n’ roll, and if a musician can’t raise a middle finger with conviction then they’re likely to get stomped by the meaner animals in this game. While this lady is usually sweetness ‘n’ light, it’s also clear she’s become a confident woman in this ugly business as she and her talented band continue their eventful rise in 2012. There are few groups DI has more faith in for the long haul. Their foundations are solid, their songs catchy, their playing tight (and tighter all the time), and their leader possessed of a voice that makes men and women a bit swoony. We’ll take this salute and offer a thumbs-up in reply. We’ve included a boffo live version of Nicki and the Gramblers’ staple “I’m Your Woman” captured in SF last week and the latest Van Session cover of George Michael’s “Faith” (nice one but we’d really be impressed if you did something off Listen Without Prejudice Vol. 1…a fave we cannot deny). Ms. Bluhm and her boys are touring their tails off this spring and summer and you really ought to go see them. Here’s their itinerary. Thanks for thinking us, Nicki!